Lone Pine is haunted by multiple spirits. Whitney Portal Road is the only road in Lone Pine crossing Highway 395 with a stop light. It leads west out of Lone Pine, through the Alabama Hills, and up to Mount Whitney, the tallest mountain in the continental United States. The road also plays host to phantom battles between ghostly Native Americans and U.S. soldiers. Originally the area around Lone Pine was populated by Paiute Indians. Everything was fine until 1860 when settlers began moving into the valley overrunning the tribe's lands with cattle and sheep. Conflict began when in the winter of 1861 - 1862, the Native Americans having issues with their food sources due to the settlers being on their lands, on the brink of starvation, finally turned to slaughtering and eating the settlers' cattle. The Owens Valley Indian War soon followed. During the war, one battle was fought on what is now thought to be present day Whitney Portal Road. Over the decades, several residents have had their day suddenly disturbed by all out battles raging right outside their home's windows. In the 1960s one woman who lived on the road heard gunfire one evening. Looking out the window she saw a black man dressed as an Indian warrior. He glanced back at her, but didn't bother her or confront her. He was soon joined by several additional Indians. They all crouched behind a tree and began firing rifles, reloading as necessary. The firing went on for fifteen minutes with not a bullet hitting the woman's house. Then, just like that, they all disappeared. Apparently the tale is fairly common amongst those who have lived in the neighborhood. Those who have heard the woman's tale, believe the black man to have probably been an ex-slave, now living amongst the Native Americans. Old bullet holes were even discovered in the direction the ghosts had been firing in. Rescue Man, the ghost of an Indian, warns travelers of impending blizzards. Continuing down Whitney Portal Road, you eventually arrive in the Alabama Hills. Over the years, a legend of a ghostly Indian has surfaced, the legend of Rescue Man or Indian Jim. Jim, a gold prospector, died in the hills in the 1940s, trapped in a sudden blizzard with the temperature plummeting below zero. Jim now helps out people who are in the hills before a storm hits, warning them to race back to town while they still can. The first person known to have run across the spirit of Jim was a friend of his, another Indian named George. George had been up in the hills looking for Tungsten, when suddenly Jim was in front of him calling his name. Jim warned George to "Go" pointing back towards Lone Pine. George, deciding it best to not ignore the ghost's warning, high tailed it back to town, just as horrifically strong blizzard crashed into the area. George surely would not have survived the storm if he had not been warned by the spirit of the Rescue Man. Well something like twenty five years past, and the Native American guard, now into his sixties, was still protecting the cache of buried stolen gold. By now, however, Lone Pine had grown in size, and the nearby white settlers decided that a firehouse needed to be built . . . right on the spot the Native American was protecting. Well he wasn't thrilled about the new building being erected on the land he was guarding and made it known. And when he was denied access to the land, he got upset and ended up getting himself killed. He was buried by other Native Americans nearby. But, even in death, he kept protecting the land! It is said that his group's head man, even presided over his burial and asked the spirit of the man to come back and continue to protect the buried gold. And thus the firehouse became known as haunted. In 1946, Earl Richardson acquired the property with the intention of building a home upon it. His very first night staying on the property he ran across the ghostly Native American and suffered from frightening chills along with the feeling of being pushed down while he lay in bed. Although he built his house, tearing down the former firehouse, every now and then, the chills would return, and other strange phenomenon would once in awhile happen. Earl's neighbor also reported strange noises occurring occasionally. Earl's family had an unexpected addition to it. Additionally in Lone Pine there's a no longer used train depot somewhere off of Highway 395. The baggage compartment of the depot occasionally exudes eerie darkness and if that wasn't creepy enough, there are reports of a little ghost girl lurking behind the ticket counter holding a doll in her arms. If that's not enough spiritual activity for you, rumors state that the Best Western has a tall, thin, vanishing cowboy ghost who appears in several hotel rooms in the early hours of the morning. 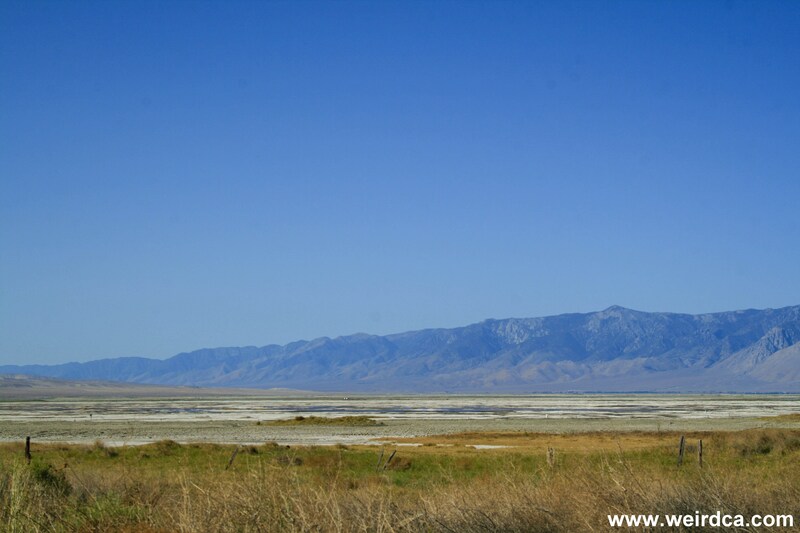 Also the nearby ghost town, Cerro Gordo, is home to a spirit or two, and lastly, it's said that on dark nights a ghostly ship sails over the dry lake bed of Owens Lake! Many years ago when my Oldest son was just 9 months old, hes,34 now, we lived in Lone Pine. One night we were in bed watching tv, my husband and I. Our sons crib was,at the bottom of our bed. I had just rolled over to go tonsleep and the next thing I know, my husband is hitting my arm frantically, saying "Oh My God" over and over. I sat up and he was pointing towards the crib, I kinda,shook my head and tried to ficus, the only light was coming from the tv. I looked down there, and I didn't see anything... That's when he said "Oh My Good God" really loud and began to pray. He was,white as,a ghost. He says he looked down to the crib where our son slept ANF there was,an old Indian woman bending over the crib, lookin g like she,was cooing and smiling and tucking the covers over the baby. Wearing traditional native clothing. My husband is part native. He says as,soon as he got my attention and I focused, she looked at him, grinned an ornery, almost devilish smile, and shook her head and Disappeared as soon as I looked. He was so Shook Up and real about it I know he saw her. Tbings,would be moved in our duplex and I was Always finding feathers. That I believed to be eagle feathers. Just laying on top of things. Also, on Whitney Portal road one rather late night we were driving, listening to music with his cousins and the higher up we went, our cassette tape started playing BACKWARDS. And, get this, No Joke, Pat Benatars, He'll is for Children was the song it did it on. We got so scared, it got SO cold in the car, and the wind started blowi g SO hard, we turned around. As,we went down, it started playing right again, the wind stopped, and we are talking It was mid summer, 110 in the shade! It it rumored that there is an Indian Buriel Ground right about where we were. We never went back up there again. I have many more stories, but I'll leave it at these 2. I Am an Absolute Believer that that Valley is Very Haunted!! I frequent Lone Pine for hiking and fishing trips. Last (03/23/18) night I stayed in Dow VIlla rm 254 in the old hotel. About 2 am I was awaken by my bed shaking. I looked around the small rm and of course nothing. About 10 minutes later same thing, bed was shaking but this time when I woke there was a young blond women sitting on the foot of the bed. I looked at her and she said when ever you remove anything from the night stand the bed shakes. I went back to sleep never felt scared or uncomfortable during the night. However, before I went to bed and was watching TV numerous times I heard people walking up and down the hallway and laughing. One of the time I peaked out the door and not a person was in the hallway. Just found your website and noticed the comment about the ghost cowboy in the Best Western at Lone Pine. It was me who posted the story a while ago on another website. My story goes - "My husband and I stayed at the Best Western, Lone Pine, California on the night of Saturday 20 April 1996. We stayed in the ''Kirk Douglas'' room as it was named at that time. We both awoke at the same time in the early hours, propped ourselves up on our elbows and both looked at a tall thin man leaning over the end of our bed. He faced us for a few seconds then turned and walked through the closed door which led outside. The black shadow of a man wore a cowboy hat. He didn't make a sound. We asked each other if we'd seen the same thing - yes we had. Neither of us were frightened by what we saw and went back to sleep. As we both saw the same thing it proved it wasn't just a dream." It's kind of hard to comprehend what happened. I do believe in ghosts but my husband, still, isn't sure. We do regret not asking the hotel staff if anyone else had ever seen anything. I know a lot of people were killed in an earthquake there in 1872 and I feel he was one of the victims. Hayley and Rob from Riplingham East Yorkshire England. My husband, daughter and myself have stayed in lone pine many times. It was always a good half way point on the way to Southern California to visit family. The last time we stayed was a couple of years ago, on this trip we decided to bring our well behaved Labrador since it was a dog friendly hotel. All night long she was very distressed. She didn't sleep all night kepted getting up and down like something or someone was touching her. The only time I have ever seen her act this way was in the very hunted town Virginia City. It's so funny to see your comments as I stayed in Dow Villa in the Summer if 2006...well we never actually stayed the night but whily Dad was downstairs talking with staff I had the weirdest and most frightening experience. As soon as we walked into the room I felt incredibly uneasy and once my Dad left the room I began to feel so completely awful, like a most frantic. I found that I just couldn't continue to sit in the room. I ran out of the room and down the corridor and the second I left the room I felt normal, I was thinking "what are you doing, you've just left your passports and money in there" so I walked back, the second i got into the room I felt mental again, like totally crazy and hysterical,it was like all of someone else's hurt and pain went into me. Basically I ended up running up as down the corridor many times until my Dad came back upstairs and told me I looked like I'd seen a ghost (lol). We stayed at the very end of the corridor on the left hand side of the old part of the hotel!! I have worked down in lone pine several times during the winter months and had stay at the Dow villa.On several occasions I experienced hearing like cowboy boots with spurs jingeling walking down the hallway and every time I would open the door to my room and look out in the hallway the sound would stop and there would be nobody there, this happened to me at least 5 or 6 times the winter of 2006. After a month stay there in November 2005 it occurred again so I moved across the street to the mt Whitney hostel I never experienced it again I definitely believe the old part of the Dow Villa is haunted! I grew up in Bishop and spent some time in Lone Pine. About 40ish years ago driving to Bishop at night just north/west of Lone Pine I saw bright lights in the hills. I am convinced it was a UFO. On my way to Bishop at night about 25 years ago same thing on the south/east side just before Lone Pine near the river. In Lone Pine, the Dow Villa Motel is very, very haunted. Ask the night time front desk person, they have numerous stories. My wife and I both have had many strange occurances in our many stays there. Write if your interested!